The Middle East: Who says popular quest for change has been quelled? A series of recent mass protests in several Arab countries have called into question suggestions that civil wars, brutal crackdowns and military coups and interventions have quelled popular willingness to stand up for rights in the Middle East. The protests, although focussed on specific social and economic demands, fundamentally have the same objectives as popular revolts four years ago that toppled four autocrats: dignity, social justice and greater freedoms. The civil wars in Libya and Syria, Saudi military intervention in Bahrain and Yemen, the Gulf-backed military coup in Egypt, and the rise of the Islamic State seemingly put hopes for a democratic transition in the Middle East and North Africa to bed. The struggle against jihadist extremism and populations cowed by the violence and the brutality that counterrevolutionary forces were willing to employ had buried any chance of renewed civic protest. Protesters in Lebanon, Iraq and Egypt are voting down that notion with their feet. Lebanon’s protest slogan, ‘You Stink,’ refers to much more than the piling up of garbage on the streets of Beirut and a government that can’t even put an efficient waste management system in place. It refers to a mainstay of governance across the Middle East and North Africa that is characterized by systemic corruption, a total lack of transparency and accountability, and a willingness to brutally suppress dissent. 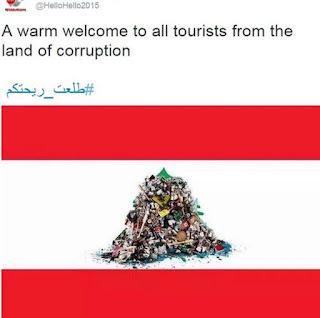 The Lebanese protests go even further. They constitute evidence that sectarian divides between Sunni and Shiite Muslims, often at the expense of non-Muslim minorities, are artificially manufactured by autocrats ruthless in their effort to ensure survival of their regimes. Members of the 18 sects that make up the Lebanese mosaic suffer equally from the penchant smell of uncollected garbage and associated health hazards. The initial heavy handed Lebanese security force response to the protests suggested that Arab leaders had learnt little from the experience of 2011. Police brutality egged on by suspected provocateurs among the demonstrators fuelled the protests much like what happened in Bahrain four years ago and what helped transform a popular revolt in Syria into a brutal civil war. Lebanese with memories of a bloody civil war that wracked their country from 1975 to 1990 are steadfast in their demands but determined to ensure that their protests do not get out of hand. In a similar vein, hundreds of thousands of Iraqis have spilled in recent weeks into the streets of Baghdad and southern cities like Basra every Friday to protest corruption and demand an improvement in basic public services. Sunnis and Shiites are among the protesters in a country that has been at war for much of the 12 years since the US toppling of Saddam Hussein in 2003, been shaped by sectarian politics since, seen its minorities brutalized and forced to leave, and has lost significant territory to the Islamic State that represents the most brutal expression of sectarian hatred. Protesters chanted "Sectarianism is dead" and "They are stealing from us in the name of religion!" Much like the self-immolation of Tunisian street vendor Tarek al-Tayeb Mohamed Bouazizi in December 2010 sparked the Arab revolts that toppled the leaders of Tunisia, Egypt, Libya and Yemen, the Iraqi protests were fuelled by the killing by security forces in July in Basra of a young protester, Muntather Al-Halfi. “We are tired of the conditions that we are forced to endure in Iraq. Politicians have no understanding of the daily struggles people face. Some high-ranking officials…are protected by their privileged status and they don’t care about our situation… Our fundamental rights to essentials such as education, health, housing, work, food, access to potable water and electricity have been compromised since Saddam Hussein’s regime fell 12 years ago,” Iraqi artist Nibras Hashim told an online news service. “Politicians made them believe that all this was due to religious divisions. These protests are a political awakening, a revival of people’s consciousness. It’s also a symbol of unity: during the demonstrations, we march together, both those who are secular and religious, Sunni or Shiite. Together, we form one body with no particular group coming out on top,” Hashim went on to say. Unlike Lebanon and Iraq, Egypt is a far more homogeneous society with a Coptic minority that has largely been supportive of the repressive regime of general-turned-president Abdel Fattah Al Sisi. Nonetheless, militant soccer fans and students have staged 807 anti-government protests between October of last year and June of this year, according to Democracy Index. That makes it even more startling that the fans’ and students’ nemesis, the feared and despised police force, has joined the fray. Security forces were called in to squash protests in defiance of Egypt’s draconic anti-protest laws by low-rank police officers in several Egyptian governorates, including Cairo, in demand of demanding better employment benefits and bonus payments. Separately, tax authority employees demonstrated against the introduction of a new civil service law designed to streamline Egypt’s unwieldly bureaucracy. The Interior Ministry accused the policemen, the bottom of the heap of the 1.7 million strong Egyptian security forces, of being supporters of the outlawed Muslim Brotherhood, who’s democratically elected President Mohammed Morsi was removed by Mr. Al Sisi from office, of endangering Egyptian security at a time that the country was confronting a jihadist insurgency. Leaders in Lebanon and Iraq have responded in more conciliatory terms. Iraqi Prime Minister Haidar al Abadi promised to root out corruption and streamline his government. Lebanon’s cabinet put its paralysis on full display when met it this week to discuss the crisis. Rather than announcing immediate steps to rid Beirut of its garbage it referred the issue to a ministerial committee. The renewed protests may not immediately topple regimes like they did in 2011 but they do reflect fundamental change in the Middle East and North Africa with anger and frustration over corruption and incompetent and repressive government bubbling at the surface. They also suggest that the largely short-lived success of the 2011 revolts has not extinguished a deep-seated desire for change and a willingness to take to the streets. The power of the protests is reflected in the fact that major political figures and groups including Lebanon’s Hezbollah and the Hariri movement, Iraqi Shiite leader Grand Ayatollah Al-Sayyid Ali Al-Husseini Al-Sistani and Iraqi Shiite militias have either declared their support or joined the demonstrations. The wide support is both an asset and a liability with established groups linked to government likely to want manipulate the protests to serve their political purpose. Moreover, like most protest movements, demonstrators in Lebanon and Iraq agree on what they don’t want: continued corruption and government that is unable to provide public goods and services. Their Achilles Heel is that views run the gamut on how their goals can be achieved and what system of government will ensure that. The protesters further lack the political experience and organization to effectively influence powerful political groupings that have their own agendas and governments who embrace their demands with varying degrees of sincerity. Nonetheless, the message the protesters are sending is addressed not only to the region’s rulers. It is also addressed to their international backers. The peaceful protests and extremist jihadism are two sides of the same coin: they are expressions of deep-seated discontent among restless populations that no longer are willing to subject themselves to inefficient, corrupt and arbitrary rule. The likes of the Islamic State can only be truly defeated if as much effort is invested in addressing the region’s political and social governance issues as is put into military campaigns and repression. With armed Kurdish youth effectively taking control of at least one predominantly Kurdish city in south-eastern Turkey, Turkish war planes pounding Kurdistan Workers Party (PKK) positions in the region as well as in northern Iraq as well the People's Defence Forces (HPG), the PKK affiliate in Syria; Turkish authorities arresting some 1,000 alleged PKK supporters; and PKK attacks on Turkish security forces, the TFF is preparing to penalize a third league club for releasing white peace doves at the beginning of a competition match. The ruling Justice and Development Party (AKP) failed in June to win the majority it needed to again form a one party government and push through parliament constitutional changes that would turn Mr. Erdogan’s largely ceremonial presidency into an executive one. Mr. Erdogan has called snap parliamentary elections for November 1 after the AKP failed to form a coalition government. Critics and Kurdish activists charge that Mr. Erdogan hopes that the breakdown in peace negotiations between the government and the PKK and the renewed hostilities will allow him to recuperate nationalist votes and weaken the Peoples’ Democracy Party (HDP), the first predominantly Kurdish party to win seats in parliament at the expense of the AKP. The TFF’s decision to refer Batman Petrolspor to the federation’s disciplinary committee highlights the contradictions in efforts by national, regional and global soccer administrators to maintain the fiction that sports and politics are not intertwined like Siamese twins at the hip. By acting on the letter rather than the spirit of laws governing soccer, the TFF has taken an inherently political decision that works in Mr. Erdogan’s favour. It sharpens fault lines that crisscross Turkish soccer between fans and a government that in recent years has sought to secure political control of the game in its effort to undermine supporters’ power in stadia and on the streets as demonstrated in the 2013 mass anti-government protests and between clubs in predominantly Kurdish south-eastern Turkey that increasingly position themselves as Turkish Kurdish rather than purely Turkish. “I don’t know if such a penalty exists anywhere in the world. At first we thought they were joking. We only realized it was real once we got hold of the documentation. We aren’t going to file a defence, because we don’t recognize our action as a crime. We are willing to accept any form of penalty. We’d prefer peace in the country and in the region to any championship,” said Batman vice president Ilhan Erken. The TFF earlier this year penalized another third tier soccer club in the predominantly Kurdish city of Diyarbakir for adopting a Kurdish name. The federation charged that the club long known by its Turkish name, Diyarbakır Büyükşehir Belediyespor (Diyarbakir Metropolitan Sport), had changed its name to the Kurdish Amedspor and had adopted the yellow, red and green Kurdish colours in its emblem without the soccer body’s approval. Earlier, Ilhan Cavcav, the chairman of Ankara club Genclerbirligi SK, known for its left-wing fan base, sparked outrage among nationalists by suggesting that the Turkish national anthem should no longer be played at the beginning of domestic matches and only in international encounters. Turkey began playing the anthem at domestic matches in response to the 30-year old PKK insurgency that has cost more than 40,000 lives. A match in December 2014 between Amedspor, and Galatasaray SK, a storied Istanbul club popular among Kurds because imprisoned PKK leader Abdullah Ocalan identified himself some two decades ago as a Galatasary fan, witnessed despite pro-Kurdish expressions by supporters of both clubs the stoning of the Galatasaray team bus. “We love you, we love the one who loves you even more,” said a banner hoisted by Galatasaray fans in an apparent reference to Mr. Ocalan. Fans whistled as the Turkish national anthem played. More recently Kurdish disaffection has exploded in unrest in Cizre, a south-eastern Turkish town where armed youth roam the streets. Non-Kurdish soccer teams visiting Cizre have seen their buses and players repeatedly attacked with stones. As a result, Mr. Cavcav’s Genclerbirligi was transported in armoured vehicles when it came to play in Cizre in December. Media reports said the same vehicles had last year brought Iraqi Kurdish fighters with Turkish government approval to the Turkish Syria border from where they headed to then Islamic State-besieged city of Kobani. Ironically, Kurz’s articulation of changed (2) Israeli attitudes mirrors statements by Hamas leader Khaled Mishal, including his assessment of Israel’s demand that Hamas first recognize the Jewish state and denounce armed struggle before any potential direct talks. In a lengthy interview with Al Jazeera, Mishal described the Israeli demands as a tool to evade negotiations, noting that the United States and the Vietcong negotiated an end to the Vietnam War while the fighting continued. “The argument throws the ball into the Palestinian court … We will not surrender to Israeli blackmail,” Mishal said. He noted further that a quarter of a century after Palestinian leader Yasser Arafat first renounced violence and then recognized Israel Palestinians have yet to secure their rights. The Israeli-Hamas dance is occurring in an environment in which Israeli intelligence failures have allowed the Islamist group to gain the strategic upper hand. Israeli destruction of Gazan infrastructure may have turned the strip into a modern day Dresden. But returning Gaza to the Stone Age has not stopped Hamas from inflicting significant political and psycho- logical damage on Israel. Israeli military and intelligence sources fear that fundamental Israeli intelligence failures have put Hamas in a position to increase Israel’s political cost and determine when Israel’s longest war against the Palestinians will end. Israel’s two-month old war against Hamas has shifted from a sledgehammer approach intended to shock the Islamist militia into accepting Israeli demands for demilitarization into the one thing Netanyahu had wanted to avoid: a war of attrition that would strengthen his right-wing critics at home and risk Israel losing control of ceasefire negotiations in which Egypt did Israel’s bidding. Hamas’ refusal to bow to Israeli military superiority as well as its uncompromising insistence on a lifting of blockade and the right to furnish Gaza with an airport and sea port caught Israel by surprise. Hamas’ steadfastness leaves Israel with few good options: continua- tion of a war of attrition that works in Hamas’ favour; unilaterally declaring an end to the war that would be rendered meaningless by the continued launching of rocket and mortar attacks from Gaza; and/or accepting in the face of failure of Egypt’s biased mediation a shifting of efforts to end the fighting to the United Nations where Israel is likely to get a less sympa- thetic hearing. The effects of Hamas’ strategy are already evident on the ground. Beyond having been forced into a war of attrition, Israeli towns and settlements adjacent to the Gaza Strip have turned a majority of their residents into internal refugees. “This is a strategic achievement on a par with Hamas’ success in closing (Tel Aviv’s) Ben Gurion international airport for a couple of days last month,” commented DEBKAFile, a news website with close ties to Israel’s military and intelligence establishment (5). Hamas is likely to cement its achievement with the war threatening the opening of the school year in chunks of Israel. Parents in cities beyond Gaza’s immediate parameters have warned that they will not let their children attend school as long as the Palestinian threat persists. In addition, Israel’s international standing has been significantly dented highlighted by US and British suggestions that they may review arms sales to the Jewish state more stringently. Proponents of the shift in focus point to Israeli successes in recent years including the 2008 assassination in Damascus of Imad Mughnieyh, a widely respected Hezbollah and Ira- nian operative, who masterminded attacks on Israeli and US targets as well as a host of kid- nappings of foreigners in Lebanon, including the CIA’s station chief. They also list the killing of Iranian nuclear scientists in Iran and elsewhere, the Stuxnet cyber-attack on Iranian com- puter systems related to the Islamic republic’s nuclear program, and the 2007 destruction of a Syrian plutonium reactor built with the help of Iran and North Korea. They further argue that Israeli forces involved in Gaza benefitted from superior tactical knowledge. Those successes notwithstanding Israeli intelligence was unable to provide Netanyahu and members of his security cabinet with the necessary strategic analysis to pre-empt what has become a classic example of Machiavelli’s pursuit by Hamas of diplomacy by other means. Israeli intelligence’s inability was already evident in faulty analysis of the popular Arab re- volts that toppled the leaders of Egypt, Tunisia, Libya and Yemen as well as of Syrian President Bashar al-Assad’s strategy of allowing the Islamic State, the jihadist group that con- trols a swath of Syria and Iraq, to emerge as the major rebel group so that he could substantiate his claim that he was fighting a terrorist phenomenon that threatens not only his regime but also the region as a whole and the West. In the run-up to the Gaza war, Israeli intelligence wrongly predicted that Hamas would quickly sue for a ceasefire. In addition there were gaps in intelligence about where Hamas leaders were hiding and where the group had stored its rockets arsenal. Add to that a political failure to assess the strategic importance of the tunnels, including the fact that some of them ended on the Israeli side of the border that forced the military to change the focus of its opera- tion. Finally, intelligence underestimated Hamas’s military ability demonstrated by the Israeli military’s use on several occasions of old M113 personnel carriers with inferior armour rein- forced, at times a lack of body armour and radio communications, and the deployment of some troops that had no combat experience. Harel’s remarks are part of an informal Israeli post-mortem of the Gaza war at the core of which is not only the focus of intelligence services but also the Israeli military’s organization, strategy and doctrine. The key question is whether current organization and doctrine meets the requirements of unconventional rather than conventional warfare given that Israel’s last four wars were against the Lebanese Shiite militia Hezbollah, and Hamas. The debate about the Israeli military comes against the backdrop of its changed demog- raphy. Israel’s military today is not what it was in the late 1980s when it told then Prime Minister Yitzhak Rabin during the first Intifada or Palestinian popular uprising against Israeli occupation: ”We can solve this militarily but not on terms that would be politically or morally acceptable to the Israel Defence Forces (IDF) or the government. .. you, Mr. Prime Minister have to solve it politically.” A few years later Rabin engaged in the failed Oslo peace process with Yasser Arafat’s Palestine Liberation Organization (PLO). With analysts predicting increased differences between the military and Israel’s political leadership in the wake of the Gaza war, both entities are coping with very different political and demographic constituencies. Israel’s right-wing has moved further to the right forcing Netanyahu to fend off pressure from coalition partners like Foreign Minister Avigdor Lieberman whose Yisrael Beytenu (Israel is our Home) Party ended its alliance with the prime minister’s Likud early in the war, and economy minister Naftali Bennett’s Habait Hayehudi (The Jewish Home) Party that both advocated reoccupation of Gaza. In thwarting Israel’s strategy, Hamas has also cast a shadow over the Egyptian-Israeli alliance that Israel worked hard to establish in the wake of last year’s military coup against President Mohammed Morsi, a Muslim Brother aligned with the Islamist leadership in Gaza. Key to the stalled Egypt-led talks in Cairo is an intimate relationship forged between Israeli and Egyptian leaders. The relationship is built on shared political goals, first and foremost among which deep-seated animosity towards the Muslim Brotherhood, of which Hamas is an offshoot. Egypt demonstrated its approach in the initial days when it first put forward a proposal to achieve a ceasefire in Gaza. The proposal was rejected by Hamas because Egypt did not even bother to consult it before putting its proposal forward. Egypt has since refused to deal directly with Hamas, primarily addressing itself to Palestine Authority officials as representatives of all Palestinian factions, including Hamas. Throughout the talks Egypt sought unsuccessfully to water down Hamas’ demands because they would enable Gaza to interact with the international community beyond the control of Israel and Egypt. As a result, the Cairo talks have convinced Palestinian negotiators that Israel would like to see an end to the hostilities. Rather than that creating a basis for an agreement, it has rein- forced Hamas’ resolve. The dilemma is that “Israel demands a cease-fire before renewing nego- tiations, whereas Hamas believes that only rocket fire will make Israel more flexible,” said prominent Israeli journalist Zvi Bar’el in Ha’aretz newspaper. The paper quoted Israeli officials as worrying that Egypt’s closure of tunnels leading from Gaza to the Sinai that with the blockade were crucial for the delivery of badly needed civilian supplies without offering the Palestinians an alternative supply line could backfire. “They were actually suffocating Gaza too much,” the Journal quoted an Israeli official as say- ing. While Egypt seemed bent on effectively destroying Hamas, Israel wanted to see a severely weakened Hamas that was nonetheless capable of controlling more militant groups in Gaza. Egyptian attitudes toward Gaza were highlighted by the fact that Egypt since the toppling of Morsi has accused Hamas of conspiring with Morsi and the Brotherhood against the Egyptian state. In fact, some of the charges being levelled against Morsi in legal proceedings in Egypt involve Hamas. Israel’s intelligence and policy failures have cost it dearly. Repairing the damage is likely to be complicated and painful. Reorganizing the military and revamping its doctrine and strategy is no mean task. It involves a debate that by definition will have to also include Israel’s broader policies towards the Palestinians at a time that popular anti-Arab and anti- Palestinian sentiment is running high. The Islamic State (ISIS) has already outlived predictions of its early demise offered by some US military officials. The Islamist group has survived the near fatal assassination of its leader Abu Bakr Al-Baghdadi by airstrike earlier this year and has continued its voracious march across Iraq and Syria virtually unimpeded, holding on to territory roughly equal to the size of Belgium despite the reported deaths of some 15,000 of its fighters who were killed by US-led air strikes. “First, the pressure is from the air, and air campaigns never succeed,” James M. Dorsey, a senior fellow at Nanyang University in Singapore, with a focus on ethnic and religious conflicts, told The Media Line. “(Secondly), the pressure is economic and the effects of economic embargos are limited – look at Iran,” Dorsey added. The well-financed Islamic State is likely to be able to float itself on funds from black market oil and antiques sales despite international isolation. If airstrikes and financial blockades are not enough to end the radical Sunni group, then the unpalatable and unlikely option of ground forces remains. Israel’s borders have been identified as potential weak points in the defense of the nation. Yoram Schweitzer, head of the Program on Terrorism and Low Intensity Conflict at the Institute for National Security Studies, told The Media Line that in the north, although ISIS are not directly on Israel’s border, the Al-Nusra Front, whom Schweitzer described as being “cut from the same cloth as ISIS” – are. In the south, the Sinai Province, a particularly dangerous and effective terrorist group responsible for killing hundreds of Egyptian police officers and soldiers, has previously targeted Israel. But it was the threat posed to Jordan that Schweitzer viewed as being of greatest concern to the Jewish state. If the Jordanian government’s survival was threatened, Israel would risk losing a strategic ally, Schweitzer said, adding the caveat that for the time being the Hashemite Kingdom’s security apparatus seemed up to its task. For the time being the presence of the Islamic State has benefited Israel, the political scientist argued. “They can say that ‘we are angels’ and that ISIS is the alternative – that ‘we do nothing to the Palestinians in comparison to what happens under ISIS,’” Ibrahim said. But even if the Islamic State were not to emerge as a functioning state or if it were to be effectively destroyed, the Middle East’s woes could continue. ISIS is a symptom, not the problem in the Middle East, according to James M. Dorsey. “Destroying them is not a solution, it is a short term fix.” He explained that the region has been in transition since 2011 and this is continuing, with the Islamic State just one single expression of this. Regimes that placed their own survival over the needs of their citizens used sectarianism to divide opposition while violently quashing peaceful calls for reform, leading to the emergence of groups like ISIS, Dorsey explained. If Islamic State was to be vanquished, people might prefer to have it around again after they see what replaces it, Dorsey explained. The Israeli Ministry of Defense declined to comment on the topics addressed in this article. Reports that self-declared caliph Abu Bakr al-Baghdadi, the leader of the Islamic State, was seriously wounded in a coalition strike in early 2015 has done little to weaken the group as it fights multiple battles in Iraq and Syria. The Islamic State (IS), despite news reports that Al-Baghdadi was paralyzed in the attack has stood its ground in Syria, made advances in Iraq, and according to some Iraqi lawmakers as well as the group’s captured Baghdad bomb maker, infiltrated Baghdad that is regularly rocked by bombings. A photo picturing Al-Baghdadi sitting knees crossed that was published by a Kurdish news agency in mid-July suggested that reports that he had been injured were false or that he had since recovered. CNN’s Pentagon correspondent Barbara Starr at the same time quoted US officials as saying that Al-Baghdadi had been sighted in June in the Syrian city of Raqqa. Al-Baghdadi’s resilience is emblematic of the group’s ability to survive significant military pressure rather than collapse under its own weight as it licks its wounds in an environment in which the attitudes of some of the United States’ closest allies towards militant Islamist militias, including some associated with Al Qaeda, are ambivalent and in flux. A continued willingness to forge tactical alliances with groups considered by not only the West but also other major powers like China and Russia beyond the pale coupled with IS’s resilience raises the spectre of jihadist groups becoming a more permanent fixture on the Middle East’s political landscape. The IS leader’s resilience is also a reflection of the murky, shifting politics of Saudi-led Gulf support of jihadist groups, including IS, despite the obvious danger of backlash as is evident in IS’s declared targeting of the kingdom as well as the Al Qaeda attacks in Saudi Arabia in the very first years of the 21st century, and more recent IS attacks on Shiite mosques in the kingdom and Kuwait and on Saudi security personnel. In a speech in 2014, former head of the British Secret Intelligence Service, MI6, Sir Richard Dearlove, recalled Prince Bandar bin Sultan, once the powerful Saudi ambassador in Washington and former head of Saudi intelligence, warning him more than a decade ago that "the time is not far off in the Middle East, Richard, when it will be literally 'God help the Shia'. More than a billion Sunnis have simply had enough of them." Dearlove left little doubt that Gulf states had contributed to the rise of IS as part of their bid to not only to counter Iran but to force the demise of Syrian president Bashar al Assad, "Such things simply do not happen spontaneously," Dearlove noted. He said, referring to the kingdom’s austere interpretation of Islam, that Saudi strategic thinking was rooted in deep-seated beliefs that that there "can be no legitimate or admissible challenge to the Islamic purity of their Wahhabi credentials as guardians of Islam's holiest shrines." Dearlove argued further that Saudi leaders were convinced that they possessed a monopoly on interpretation of Islam that leads them to be "deeply attracted towards any militancy which can effectively challenge Shiadom." Scholar Madawi al-Rasheed took Dearlove’s comments a step further, noting that attacks on Shiite mosques in 2015 in Kuwait and Saudi Arabia had been perpetrated by Saudi nationals. “Such terrorism is not an export from the Levant to Saudi Arabia and its neighbours, but rather the return to its historical home of an indigenous trend of political violence. The justification for such sectarian terror was established in Saudi Arabia, where it has its ideological roots and has since seized the imagination of a new generation. It is thus unsurprising that the perpetrators were Saudis. ISIS is not simply a problem unfolding in the Levant but is in part an outcome of religious indoctrination and political conditions in Saudi Arabia… There is no doubt that hate preachers are an entrenched reality in Saudi Arabia. This is not a new phenomenon that was initiated by ISIS but is an important cornerstone of the Saudi-Wahhabi religious tradition. It flourished in the eighteenth century and continues to inflame the imagination of a wide circle of clerics and their followers today,” Al-Rasheed argued. Dearlove and Al-Rasheed’s comments on Saudi and Gulf ambivalence in the fight against IS by implication pointed to other equally fundamental factors that shape attitudes in the kingdom and other regional sheikhdoms. Leaving aside the merits of foreign intervention, the refusal of Saudi Arabia and other regional players with the exception of Iran to commit ground forces to the fight against IS highlights how the kingdom is blinded by a sectarian approach to a legitimate struggle for power. Committing ground troops would mean Saudi troops fighting alongside the Iraqi military and Shiite militias that both answer to a Shiite government in Baghdad – a heresy in a Saudi world view that despite the arrest of hundreds of alleged IS operators in the kingdom sees Iran rather than IS as the greater threat to Saudi national security. In fact, if national security is defined as survival of the Saudi regime, both IS and Iran pose a mortal threat. Both challenge the Saudi claim as the Custodian of the Holy Cities, Mecca and Medina, to have developed the one and only legitimate form of Islamic rule. The Islamic republic’s challenge is multi-fold: a republic rather than a monarchy established as the result of a truly popular revolt and legitimized by an institutionalized, albeit flawed, electoral process, that propagates a revolutionary instead of a status quo approach to geopolitics. For its part, IS’s declaration of a caliphate by implication dismisses the Islamic credentials of Saudi rulers and propagates political activism and jihadism rather than the kingdom’s adherence to quietist Sunni precepts of obedience to the ruler. Moreover, Gulf engagement with jihadist groups was further part of what international relations scholars Bulent Aras and Richard Falk described as authoritarian leaders’ “learning process” in their desperate need “to develop new strategies…(and) cope successfully with recent geopolitical challenges,” making use “of concrete geopolitical reasoning to shape a problem-solving agenda designed to facilitate authoritarian survival.” Aras and Falk argued that the popular revolts had rewritten the political geography of the Middle East and North Africa with “the erosion of regional structures, alienation of non-Arab elements, empowerment of non-state actors and reproduction of old problems in a new context.” IS in particular by challenging the notion that political conflict occurred exclusively within the boundaries of or between sovereign nation states called into question the regional order in the Middle East and North Africa. “New territorial entities are surfacing on the periphery of regional geopolitics…(that are)…directly challenging the stability of central powers acting within this regional system,” Aras and Falk said. In effect, IS, with its roots in the Islamic State of Iraq founded more than a decade ago by Abu Musab al-Zarqawi, is not simply a product of the United States’ ill-conceived invasion of Iraq but more importantly of a fundamental crisis of Sunni Arab politics. IS is “a true and genuine product of the current reality and is objectively indicative of the extent to which political, moral, cultural, and social conditions (in the Middle East and North Africa) have deteriorated… It as an ‘entity’ alien to the outcomes and consequences of corrupt authoritarian regimes, on the one hand, and deteriorating social contexts, on the other hand. These malaises are further exacerbated by the stagnation and defects of the intellectual and jurisprudential systems in the region as a whole… (It) is an expected product of the current Arab social and political reality, particularly in Iraq and Syria. IS has re-emerged and found a fertile chaotic climate, where sectarian and ethnic conflicts are raging, and the nature of the struggle has transformed into an identity-driven one, turning political processes into societal conflicts, rather than purely political or partisan competition,” concluded scholars Hasan Abu Hanieh and Mohammed Abu Rumman in a study of IS. The most recent IS attacks and Al-Baghdadi’s declaration of the caliphate, a direct challenge to the fundamental precepts of the kingdom, have recently swung the Saudi pendulum back to jihadist groups opposed to the Islamic State with Jabhat al Nusra, an Al Qaeda affiliate, in the forefront. Nusra and its allied have made significant advances in Syria and put the Assad regime on the defensive. Saudi Arabia, other Gulf states and Turkey appear willing to grant support despite the failure of Qatari efforts to persuade Nusra to break its ties to Al Qaeda. A flurry of meetings of various rebel groups; the recent dissolution of the Levant Front, the largest rebel alliance in Aleppo; the unexpected presence of the leader of the Saudi-backed Islam Army that operates out of Damascus, Zahran Alloush, at a recent gathering of Syrian clerics and rebel groups in Istanbul; and talk of Saudi efforts to bring rebel groups together in Riyadh to discuss the creation of some kind of representative political entity, suggests stepped up Saudi, Turkish and Qatari efforts to turn the tide in Syria’s four year-old civil war. Jamal Khashoggi, a well-connected Saudi journalist quipped in a recent tweet that Alloush’s visit “to Turkey removes the last obstacle for Saudi-Turkish-Qatar cooperation in Syria.” Alloush’s cousin, a leader of the Revolutionary Command Council, an insurgent alliance that includes the Islam Army, added that Turkey was seeking to unite rebel groups across Syria. The Saudi-led efforts to defeat Assad involve playing jihadist groups against one another, a risky strategy that irrespective of the outcome of internecine jihadist struggle would ensure that jihadism remains deeply entrenched within the legal boundaries of Syria. It also means that IS, widely viewed as the world’s richest jihadist group despite reduced revenue streams as a result of curtailing by the US-led coalition of income from the sale of oil from captured Syrian and Iraqi oil facilities and diminished ransom returns from kidnappings, is likely to be a major player. IS is aided by the fact that confrontation of the jihadist group does not constitute the top priority of any of the forces arrayed against it. “None of its enemies considers defeating ISIL to be its paramount priority. All…have at least one other enemy or goal that it firmly believes is more important. Hence a band of terrorist maniacs – who seem almost as suicidal as they are homicidal – is surviving armed conflict with everyone else simultaneously. The prioritising of something or someone else constantly holds these parties back from fully attacking ISIL or provides it with some kind of backdoor out of calamity,” argued Gulf scholar Hussein Ibish. Lebanon’s Shiite militia Hezbollah needs to take its position at home into account and keep an eye on Israel with pundits predicting that another war with the Jewish state is inevitable; Iraq needs to get its own house in order before being able to focus all its energies on IS; Jordan is struggling economically as a result of the influx of Syrian and Iraqi refugees and is dealing with fallout of the Palestinian issue; Saudi Arabia and the Gulf states are fighting a troublesome war in Yemen; Syrian president Bashar al-Assad is happy to see the US-led coalition do its dirty work while he concentrates on confronting other Syrian rebels; and Iraqi and Syrian Kurdish rebels are seeking to strengthen enclaves of their own as Turkey targets primarily the Kurdish Workers Party (PKK) rather than IS. Recent IS attacks in Gulf states like the mosque bombings in Kuwait and Saudi Arabia should make confronting the group a higher priority for the conservative sheikhdoms. Successfully challenging IS would however would have to entail a fundamental change of policy that alongside counterterrorism would allow Gulf autocrats primarily in Saudi Arabia and Bahrain to launch a sincere dialogues with citizens of different religious beliefs and adopt inclusive policies that no longer marginalize Shiite communities. No Gulf state appears willing to embrace the kind of reforms that would be needed to confront IS on levels more effective than the military battlefield. In that void, IS has the space to entrench itself and carry out well-prepared plans for the creation of a revolutionary state. A cache of documents belonging to one of the architects of IS that were obtained by German magazine Der Spiegel illustrates how a former Iraqi Baathist military officer designed in neat diagrams the structure of a future Islamic state divided into provincial councils that are dominated by intelligence and security services. An Al Jazeera Center for Studies analysis of IS’s state structure mapped its government as being made up of councils, including the advisory Shura Council that in theory has the power to depose the caliph, but in practice makes recommendations for senior appointments and offers non-binding advice on issues of war and peace and day-to-day issues that are not explicitly covered by the Quran or the Sunnah, teachings, deeds and sayings of the Prophet Mohammed. Ahl al-Hal wal Aqd (Those Who Loosen and Bind), the equivalent of a parliament that is rooted in Islamic jurisprudence and includes members of the Shura Council as well as local leaders, was the institution that appointed Al-Baghdadi as caliph. Other councils deal provide Islamic guidance, operate the judiciary, oversee media policy, manage finance and budgets, supervise the military, oversee security and intelligence, and administer IS’s provinces. Some Iraqi officials believe nonetheless that the Baathist contingent in IS’s power structure could also prove to be the group’s Achilles Heel. The officials argue that the jihadists had dashed Baathist hopes that they would be the dominant force and instead have exploited the skills of the former officers and officials of the regime of Saddam Hussein for their own purposes. “The plan of the former Baathists was to use ISIS as a Trojan horse to derail the political process and to take over. But in the end, it is ISIS that used them instead,” Maj. Gen. Tariq al-Asal, a senior Iraqi Interior Ministry officer and the former police chief for overwhelmingly Sunni Anbar province, told The Wall Street Journal. The officials point to signs of divergence between the Baathists and the jihadists, including a number of statements by one, major group of Baathist insurgents, Jaish Rijāl aṭ-Ṭarīqa an-Naqshabandiya (The Army of the Men of the Naqshbandi Order) founded by Izzat Ibrahim al-Douri, who was reportedly killed by Iraqi troops in April 2015. As Saddam’s right hand, Al-Douri had been responsible under the former Iraqi leader for forging ties with militant Islamist groups. Nonetheless, by linking the name of his group of insurgents to a Sufi order, Al-Douri was putting on public display the differences between the Baathists and the jihadists with their austere interpretation of Islam. The group condemned in February 2015 the burning alive by IS of a captured Jordanian pilot and has taken issue with the group’s destruction of religion and heritage sites and persecution of minorities. It also paid condolences for the death of Saudi King Abdullah and congratulated King Salman bin Abdulaziz Al Saud, a sworn enemy of IS, on his ascension. Visits to Lebanon by Syrians residents of IS-controlled territory highlight problems in how the international community copes with an entity that holds out the prospect of longevity despite being a pariah and under continuous military, economic, and political attack. The visitors often in Lebanon to visit family are frequently stopped by security forces on suspicion of being jihadist operatives because they carry identity cards issued to every resident by IS. The visitors are caught in a bind being unable to travel in or out of the Islamic State without those identity cards. Similarly, IS’s neighbours have turned a blind eye to smuggling that contributes significantly to its income stream. “IS has done what others talked of. It has an army comprising highly equipped regular forces as well as guerrilla forces, it controls a large territory, it has an oil industry, it has a tax system, it has a system of local government and a system of justice. It fights like a state, it sees like a state and it punishes like a state. It carries conviction and meets with belief. It doesn’t care that it horrifies us; it knows that millions of Muslims have been horrified by what our governments have been doing to them,” said Middle East historian Hugh Roberts. The Syrian Observatory for Human Rights reported that IS had introduced the licensing of Internet cafes and ordered them to ensure that their wireless was only available in the confines of their premise rather than also to their neighbours in an effort to control access to information. IS has proven capable of institutionalizing taxation and levies and administering Sharia’a justice. Absentee landlords who receive rents from property owned in IS-controlled territory report that they receive payments with officially documented taxes deducted by the group’s administration. IS has further fixed power lines, dug sewage systems and painted sidewalks in northern Syria. It enforces food security controls, searching markets for expired food and sick animals. It runs a regular bus service across what was once the border between Syria and Iraq and recently reopened a luxury hotel in Mosul. Newlyweds were offered a free three-night stay, meals and all. It has advised wounded residents that they no longer need to travel to Turkey to acquire prosthetic limbs because they are now produced domestically in the Islamic State. In doing so, IS offers a semblance of order, albeit a harsh one, in a region that has succumbed to mayhem and bitter sectarian warfare. “It is not our life, all the violence and fighting and death. But they got rid of the tyranny of the Arab rulers,” said a worker and IS resident. IS video clips that show children cheering IS forces, attending execution, training to fight, and learning how to use automatic weapons in ambushes and plant an improvised explosive device (IED). “They are giving them lessons in jihad. It was brainwashing. They were teaching the children to rebel and inform against their parents, telling them to put Islam first and encouraging them to disobey their parents as blasphemers… This generation has no culture, no education, no future,” said Wissam, a Syrian who fled to Turkey from Raqqa. Wissam was echoing conclusions of a United Nations report that noted that IS “ISIS prioritises children as a vehicle for ensuring long-term loyalty, adherence to their ideology and a cadre of devoted fighters that will see violence as a way of life.” The report said some schools had been turned into training camps. “In Raqqa city, children are gathered for screenings of videos depicting mass executions of Government soldiers, desensitising them to extreme violence. By using, conscripting and enlisting children for active combat roles, the group is perpetrating abuses and war crimes on a massive scale in a systematic and organised manner,” the report said. In focusing on education, IS is following in the footsteps of newly independent states that after throwing off the shackles of colonialism needed a new national narrative that countered the allegedly civilizing mission of the former colonial power, introduced an element of heroism as part of the development of a national identity and vision, and allowed the new rulers to consolidate power. IS’s narrative is articulated, according to scholar Laurie A. Brand, in its educational curriculum directive that replaces Syria’s official designation as the Syrian Arab Republic with the Islamic State and bans the Syrian national anthem. Concepts of patriotism and Arab nationalism make way for adherence to Islam, the community of the faithful, strict monotheism and Muslim land on which God’s path governs. Homeland is God’s rather than that of its inhabitants. With institutionalization, IS has put in place the building blocks it needed to obtain at least the consent, if not the support, of significant segments of the population it controls, including the ability to establish order in areas where anarchy disrupted livelihoods, police a territory effectively and identify and punish distractors and reward supporters, and govern and supply the local population with public goods and governance. “ISIS has the capacity to deploy an organization staffed by motivated cadres, and this goes a long way toward explaining its success and its ability to prevail over its more fragmented rivals… Like other revolutionary groups in the past, ISIS (IS’s past designation that was changed in June 2014 with the declaration of the caliphate) has profited handsomely from the infusion of foreign fighters in its ranks, a feature of rebel groups that have had the capacity to rely on a diffuse transnational social movement. However, the strength of ISIS cannot be reduced to the contribution of foreign fighters, who remain primarily in the organization’s lower ranks, but instead is derived in part from its ability to link up with the population, once it becomes its de facto ruler.,” noted political scientist Stathis N. Kalyvas. Institutionalization in territories controlled by IS coupled with the group’s battlefield resilience and the fact that the state’s neighbours are forced to deal with the reality of its existence as evidenced by the problems posed by travellers suggests the irredentist entity is a fixture that is not about to be vanquished. The entity’s continued existence calls into question the goal of the US-led alliance announced with the launch in 2014 of airstrikes of degrading and destroying the Islamic State. It also punctures the notion that Iraq and Syria can be restored as nation states in their status ante quo. The US effort to definitively defeat IS are further undermined by the fact that allies like Iraq and Saudi Arabia represent models of governance that have failed to deliver and have fuelled the proliferation of Sunni jihadist sympathies. “It’s time to ponder a troubling possibility: What should we do if the Islamic State wins?... An Islamic State victory would mean that the group retained power in the areas it now controls and successfully defied outside efforts to ‘degrade and destroy’ it… (Political scientist Barry R.) Posen says that the United States (as well as others) should deal with the Islamic State the same way it has dealt with other revolutionary state-building movements: with a policy of containment. I agree,” said international relations scholar Stephen M. Walt. Underlying the debate between realists like Posen and Walt who root their argument in the alliance’s unwillingness to commit ground troops to the fight, the inherent weakness of the Iraqi armed forces and past experience of revolutionary states like the Soviet Union, China, and most recently Iran – all states that were initially ostracized but ultimately integrated into the international community -- and proponents of a military-focused approach is a straight forward question: What constitutes the greatest threat to regional and international stability, IS’s disruptive expansionary goals or its ideology? Is the confrontation with IS primarily a war in the traditional sense of the word or a war of ideas? Lawrence Rubin argues in a book published in 2014 that transnational ideologies present a greater and more immediate national security threat than shifts in the military balance of power. “An internationally recognized Islamic State would create an ideational security dilemma with its neighbours in which ideological power, not military power, would be the primary trigger of threat perception and policy. Even if IS did want to become a legitimate state, the internal threat it poses through the potential recruitment and mobilization of the citizens of Sunni Arab states would make its socialization within the Middle Eastern order extremely difficult and unlikely,” Rubin wrote. The problem with the debate is that it focusses on the nature of the threat and ways to neutralize it rather than on what has sparked not only an immediate threat but one that has been emerging and mushrooming over a period of decades. The debate ignores the fact that radicalisation is being fuelled by misguided foreign policies and diplomacy as well as repressive, exclusionary domestic strategies that produced social marginalization, huge gaps in income distribution and dislocation of resources in corrupt autocracies with youth bulges that populate a swath of land stretching from the Atlantic coast of Africa to the Indian Ocean. It also ignores the fact that IS is equally a product of an epic power struggle in the Middle East and North Africa being waged by some of the closest allies of the US in its campaign to defeat the group. At the bottom line, neither military action nor intellectual engagement is likely to defeat IS without a questioning of the notion that autocracies irrespective of their ability to provide goods and services and ensure that citizens regardless of ethnicity or faith have a stake in society either guarantee stability in the Middle East and North Africa or are the better of two evils. Policy and academic debate has seemingly chucked aside the realisation in 2011 that governments, analysts and pundits were caught off guard by a wave of mass anti-government protests and popular revolts because of a false belief that the region was characterized by popular apathy in the face of strong regimes. If anything, IS despite its unprecedented brutality and intolerant ideology, suggests a radicalization of what initially were peaceful attempts at regime change as a result of counterrevolutionary policies by autocrats who are equally brutal in their repression of dissent and no less willing to risk the region being engulfed in sectarian strife in their bid to retain absolute power. The brutal suppression with the help of Saudi troops of an initially non-confessional popular revolt in Bahrain in 2011 and the Assad regime’s violent forcing of the transition of peaceful anti-government protest into bloody civil war are prime examples. Developments in the region suggest that rather than approaching the Middle East and North Africa in terms of an Arab Spring that has transformed into an Arab Winter, there is a need to recognize that the region remains in transition, albeit one that is messy, ugly and bloody as much because of retrograde forces like IS that have taken the lead in response to counterrevolutionary forces determined to avert change at whatever cost. As a result, a defeat of IS with or without a bringing in from the cold of Jabhat al Nusra would do little to halt radicalization or prevent the emergence of a yet more extreme group in much the same way that IS eclipsed Al Qaeda. Containing IS rather than seeking to defeat it may be riskier in the short-term and involve a far greater effort to achieve real change but is likelier to produce greater and more sustainable stability in the middle and long-term. In many ways, containment would build on key lessons learnt from confrontation with politically violent groups, particularly religiously motivated ones, such as Lebanon's Hezbollah, Palestine's Hamas, Pakistan's Lashkar e-Taibe and Afghanistan’s Taliban. By creating a state, IS has taken the success formula of militant politicized religious groups - the provision of social services, education, health, and enforcement of law and order – to new heights. Proponents of containment note that some two decades of military efforts to defeat jihadism has failed to dampen the ideology’s appeal and has probably enhanced the ability of militant Islamist groups to recruit. “Case studies from Algeria and lessons learned from the Cold War suggest that if the strategic goal truly is the complete defeat of IS, success will likely come more from IS internal failings rather than external military force,” said Middle East scholar Clint Watts. Containment’s success depends however on significant segments of IS’s population not only becoming disillusioned with the group’s ideology and practices but also being offered credible alternatives. That again would have to involve fundamental change in countries across the Middle East that have joined forces against IS. Essentially arguing in that vein, scholar Marc Lynch warned that defeated insurgencies and movements “often rise from the ashes even stronger and better adapted than before.” Lynch pointed to the resurgence of al-Qaeda after its 2001 defeat in Afghanistan and IS itself after having suffered significant setbacks in in Iraq in the years between 2007 and 2010. In a 2009 study, Eli Berman, a former member of the Israeli military's elite Golani brigade-turned-University of California economist, argued that it was not religion that turned the likes of Hezbollah and Hamas into some of the world’s most lethal and seemingly sustainable militant groups, but their creation of a mutual aid environment that limits the ability of those under their control to seek economic and social opportunities elsewhere. IS fits Berman’s definition of such militant groups as economic clubs that cater to the spiritual and material needs of their dependent members. It is a lesson that has seeped into the doctrine of counter terrorism and counter insurgency hearts-and-minds strategy but appears to be have been lost in the debate between realists and those that put the emphasis on the war of ideas. As a result, in a twist of irony, IS and the US military have adopted similar approaches, which involve a “clear, hold, build” strategy that is dependent on the buy-in of a local population. IS focuses on resource-rich areas and urban centres where it can impose taxation and introduce a governance structure that excludes its Islamist competitors. “The provision of services is a key tool through which IS initially appeals to people in its area of command, and it has sometimes dismantled existing institutions and sought to implement its own state structure by establishing courts, police and schools and imposing sharia law… IS sometimes appropriates schools and other institutions, giving those working within them the ‘option’ of keeping their positions, but under its control,” noted Middle East analyst Lina Khatib. In doing so, IS relies on the fact that security and safety in war-battered Syria is a more important concern than democracy and liberal freedom. Its continued sway is enforced by intimidating brutality in an environment where resistance is barely an option. Exclusively military-focussed efforts like initiatives to confront IS on the battlefield of ideas fail to take IS strategy into account weaken the ability of the group’s opponents to exploit its weaknesses. This failure increase the likelihood of IS’s state becoming a more permanent fixture. Neither addresses the fact that popular support for IS is less ideological and more because its residents either don’t have alternatives or see it as the best of a set of bad options; growing discontent with public brutality and a governance system that remains in flux and contradictory as it develops; differences within the administrative and military ranks of IS as a result of ideological fluidity; resentment against the undermining of tribal authority; and complaints about favouritism accorded foreign fighters in terms of income, housing and access to goods and services. In perhaps the first indication that IS is sensitive to public opinion, Al-Baghdadi in July 2015 banned further publication of videos showing beheadings in an effort source "to be considerate of Muslims and children's feelings who may find these scenes grotesque,” according to Arab media reports. "People hate them, but they've despaired, and they don't see anyone supporting them if they rise up. People feel that nobody is with them," a 28-year-old Syrian with family in IS-controlled Mosul who asked to be identified only by the nickname he uses in political activism, Adnan, told Associated Press. Adnan was one of 20 Syrians and Iraqis interviewed by the news service about life under IS that they backed up with leaflets, application forms, and other paperwork documenting restrictive rules and regulations that were brutally enforced by the Hisba, the state’s religious police. The United States, in an effort that critics say is hindered by a history of broken promises in Iraq, has more recently sought to forge alliances with potential opponents of IS in Syria. Modelled on the US-sponsored Sunni Awakening that in 2006 drove IS’s predecessor, Al Qaeda in Iraq, out of predominantly Sunni Anbar province, US officials have begun to U.S. officials have begun to map the social and economic landscape of northern and eastern Syria with a focus on the region’s intricate Sunni tribal and clan relationships, including family ties to IS. US officials hope the mapping exercise will enable them to forge a force capable of confronting IS on the battlefield. Initial US success in marshalling Sunni tribal forces benefitted from the presence of US troops in the country, frequent on the ground meetings that created an environment of trust, US financial and military support, and a US pledge to ensure that Sunni Muslims would have a stake in the Shia-dominated government in Baghdad, which would include the integration of their militias into the Iraqi armed forces. More than four years into the Syrian civil war, the US lacks the assets it was able to leverage in Iraq. Sunni tribal leaders moreover recall that US failed in making good on its promise to ensure their inclusion in the post-Saddam power structure. They also remember that President George H. W. Bush effectively called on Iraqis in the wake of the 1991 liberation of Kuwait from Iraqi occupation to revolt against Saddam only to then allow the Iraqi leader to brutally repress a predominantly Shiite revolt. Those memories are reinforced by the US refusal in its confrontation of IS in Iraq to arm Anbar’s Sunni tribes because it fears that would undermine the authority of the Iraqi government. In talks with US and Arab official, Syrian tribesmen contrasted the US refusal with its willingness to arm the Kurds in northern Iraq. Current military and ideological confrontation of IS will at best contain it and hinder its plans at global expansion. The likelihood that defeat of IS being unachievable in the foreseeable future is compounded by counterrevolutionary and sectarian policies fundamental to US allies, foremost among which Saudi Arabia for which opportunistic support of jihadist groups is a tool to box in Iran and ensure regime survival. As a result, IS more likely than not to remain an irredentist force not only in the immediate vicinity of its territorial entity but far beyond. Containment rather than eradication will therefore inevitably become the goal of the US-led coalition. That could deprive IS of its revolutionary appeal that has served it well as a recruitment tool but at the same time threatens to give rise to an even more extremist and brutal force as difficult as that may be to envision.